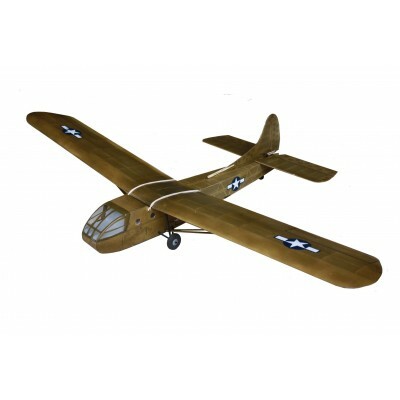 The Waco CG-4A was the most widely used American troop/cargo glider of World War II. Designed by the Weaver Aircraft Company,(WACO) flight testing began in May 1942, and eventually more than 13,900 CG-4As were delivered. The CG-4A was constructed of fabric-covered wood and metal and was crewed by a pilot and copilot. It had two fixed mainwheels and a tailwheel for service and training. 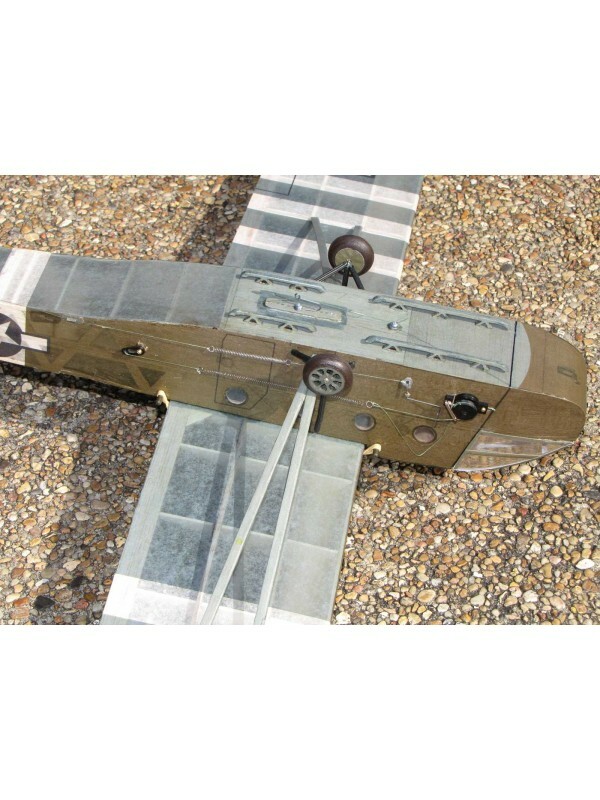 For battle a drop off dolly and wooden skids were used for rough field landing. C-47s were usually used as tow aircraft. The tow line was 11⁄16-inch-diameter nylon, 350 feet long. 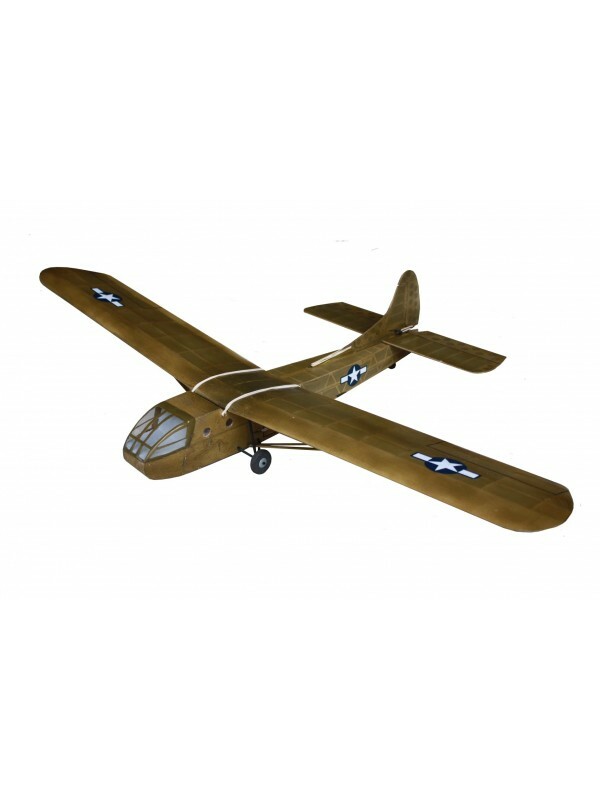 Our WACO CG-4 was inspired by an article in the October 1959 issue of Model Airplane News. (I had kept all these years) I guess waiting for FAC scale glider. The BMJR kit is scaled to .44” = 1ft. Model has a 36” span with 157 sq. 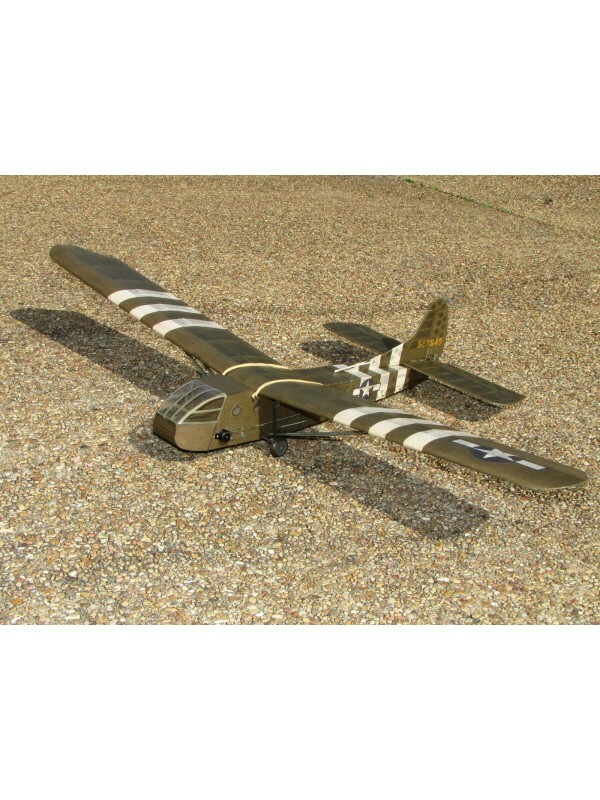 in area, Model is intended for FAC 36” scale glider Free Flight competition, high-start launch (25ft of 1/16”” rubber & 100" fishing line is provided in kit for testing and practice). 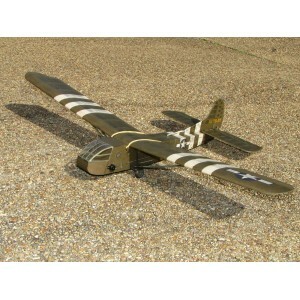 Our 1st kit built model is cover with polyspan and has a lite airbrush coat of olive drab Klass–Kote. Finished weight is 154 gr (5.4 oz) with LG and struts; 146 gr (5.1 oz) without. With judicial building, eleminating the LG and LG support structue, Japaneese tissue and dope; i'm comfident 4 1/2 oz flying weight is posible.